This year’s Discovery Trail Challenge in the Tamar Valley Area of Outstanding Natural Beauty is now just days away. If you’ve signed up to take part in the 15-mile walk (or run, for the more energetic!) along part of the Tamar Valley AONB’s long-distance route we wish you the best of luck and hope you enjoy exploring some of the country’s finest landscape. 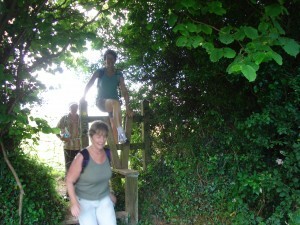 Walkers will be raising funds for this year’s chosen charity, Living Options Devon. Nisa Local (Pearces Service Station) at Drakewalls has generously donated £200 from its Making a Difference Locally scheme – the AONB team are very grateful for this kind donation. The Discovery Trail Challenge, now in its third year, will be held on Saturday 11th July. This year offers a shorter 15-mile walk, starting at Tamerton Foliot and finishing at the Tamar Trails Centre, near Gulworthy. Along the route there will be refreshment stops, First Aid stations and transport at the end, to take walkers back to the start after the walk. The AONB team would like to thank everyone involved for their support. This entry was posted in News, Tamar Valley Blog. Bookmark the permalink.